Early molecular response has been associated with clinical outcome in chronic myeloid leukemia (CML) patients treated with tyrosine kinase inhibitors. The BCR-ABL1 transcript rate decline from baseline to 3 months has been demonstrated to be more predictive than a single BCR-ABL1 level at 3 months (M3). However, it cannot be used routinely because ABL1, as an internal gene control, is not reliable for BCR-ABL1 quantification above 10%. This study aimed to compare clinical outcome and molecular response of chronic phase CML patients, depending on the percentage of BCR-ABL1 transcript decrease from month 3 to month 6 using ABL1 as an internal control gene. 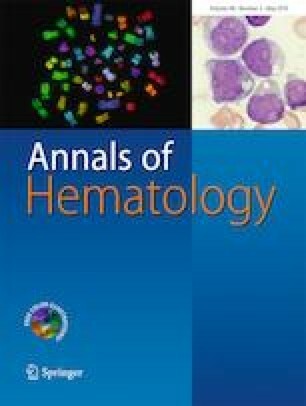 Two hundred sixteen chronic phase CML patients treated with imatinib 400 mg for whom M3 and month 6 molecular data were available were included in the study. Associations with event-free (EFS), failure-free (FFS), progression-free (PFS), and overall survivals (OS) molecular response 4 log and 4.5 log were assessed. The percentage of BCR-ABL1 decline from month 3 to month 6 was significantly linked to the EFS and the FFS (p < 0.001). A common cut-off of 67% of decline predicted the better risk of event. Patients with a decrease below 67% have worse EFS and FFS as compared to those having a higher decrease (p < 0.001). The impact was confirmed by multivariate analysis. Since the slope between diagnosis and 3 months cannot be reliable using ABL1 as an internal gene control, the second decline rate of BCR-ABL1 transcript between month 3 and month 6 could efficiently identify patients at higher risk of event. The authors gratefully acknowledge Mathieu Lewis for proofreading the manuscript and English corrections. We thank also the CRB-K Bordeaux and CRB-K Lyon for storage of samples. FXM conceived and designed the study; SD coordinated the study and wrote the manuscript; GE, FXM, and FN provided patients; FR monitored the local data; CC, SD, and SH performed the molecular analysis; IT and EK provided the cytogenetic data; SM performed statistical analysis; SD, FN, GE, BT, and FXM analyzed the data. All the authors reviewed the manuscript. All procedures performed in studies involving human participants were in accordance with the ethical standards of the institutional and/or national research committee and with the 1964 Helsinki declaration and its later amendments or comparable ethical standards. Informed consent was obtained from all individual participants included in the study. Clinical and laboratory data are recorded CCTIRS N°: 14.251 and CNIL N°: 915088. FXM, FN, and GE declare partnerships with Bristol-Myers Squibb, Incyte, Novartis, and Pfizer in support of educational, clinical, or scientific activities. SD declares partnerships with Bristol-Myers Squibb, Incyte, and Novartis in support of educational or scientific activities. SH, IT, EK, FR, CC, and BT declare no competing interest.